Taking place just a few blocks away from the theaters screening the world's genre cinema delights in Bucheon, the Network of Asian Fantastic Film (NAFF) returned for its 11th edition to promote the global genre hits of tomorrow. In all, 26 hopeful projects pitched their stories to investors, distributors, festivals, producers in the Koryo Hotel as record temperatures pounded the pavement outside. Beyond the usual IT Project lineup, there was also an Indian focus, as well as projects supported by Nordic Genre Invasion, Blood Window (in South America) and Sitges Pitchbox. In a surprise turn, the main Bucheon Award at NAFF (worth $13,300) was split between Abdul Zainidi's Bhutanese selection Worm and the Widow and Sokyou Chea's Soul Searching from Cambodia. The B.I.G. NAFF Award ($8,800) was awarded to Vishal Furia's Bogie No. S4 from India, the B.I.G. NAFF Korean Award ($5,300) went to Jeon In-hwan's Remember, Spring and the DHL Award ($4,400) was swept up by the Finnish project Sound from the Deep by Joonas Allonen. 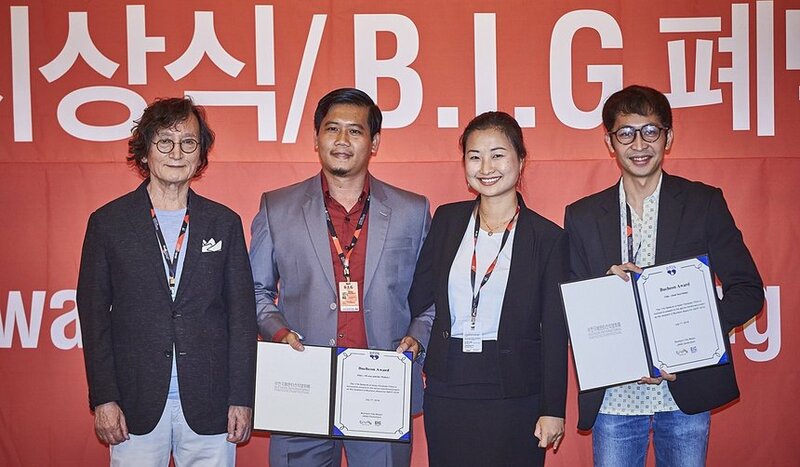 Beyond cash prizes, the Korean project Superpower Girl by Kim Soo-young earned the Color Award (Digital Intermediate), the Mocha Chai Award (Post-production) was won by Victor Jaquier's French project Matilda Corkscrew, and the Moneff Award (Editing) went to the Vietnam-Japan-US co-production The Saigon Visitor by Dave Boyle. Finally, the Sitges Pitchbox Award, which includes an invitation to the Pitchbox event at the Sitges International Fantastic Film Festival, went to China's Siri by Woo Mingjin, and the Blood Window Award was also won by Bogie No. S4. A big congratulations to all the winners and with a little luck, it shouldn't be long before some of these come to life and return to BiFan and other genre events where we can see them as completed projects.